loving. living. small. 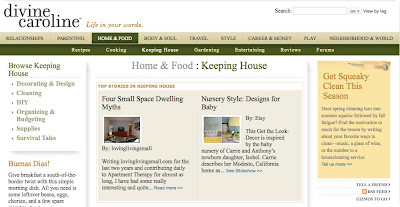 | live small with style: BLOGGING SMALL SPACES AT DivineCaroline And You Can Blog Too! And You Can Blog Too! Have you heard of DivineCaroline? If not, then you are in store for a fab site! DivineCaroline is an "online magazine where real women publish like real pros." Yes! You can sign up and submit articles, stories, thoughts on anything from home, relationships, parents, body & soul, travel, style, career, the list goes on and on! The people in the network - like you and me - create the network! How cool? And if you are wondering about adding yet another thing to do in the day (work, life, family, friends and blogging takes up a lot! ), consider this another sweet community to be part of! While I am dedicated to loving. living. small., I also want to meet new people and the dc community is perfect for that! If you are interested in joining, click here to check it out and read an article I wrote about the Four Small Space Dwelling Myths. Thanks for providing the link. IT is a great site too!